Fisher Scientific, part of Thermo Fisher Scientific – the world leader in serving science, offers a huge choice in laboratory equipment, consumables, chemicals and reagents. One source for over 180,000 product lines satisfying the majority of laboratory needs. Too numerous to mention all products - check out our website http://www.fisher.co.uk/ to view our complete product range and order on-line. Science World, the Fisher Scientific Laboratory Experience, broadened its audience in Germany by going to Kap Europa, Messe Frankfurt on 9 May. Thermo Fisher Scientific, the world leader in serving science, today announced it has delivered 34 events across Europe in 2016, including Sweden, Norway and Finland which came into the mix for the first time. Science World, the trade fair in the world of the laboratory, will be held for the 1st time in France September 29, 2016, at the Palais de la Musique des Congrès. 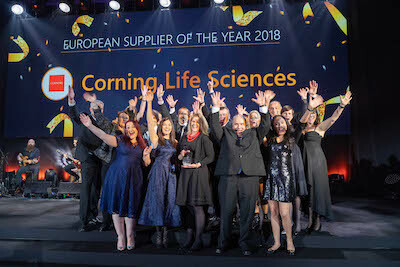 Thermo Fisher Scientific, the world leader in serving science, recently announced the winners of the Fisher Scientific Supplier Awards during its fifth Fisher Scientific European Sales Conference in Malta. Science World, the United Kingdom’s premier laboratory experience, is gearing up for its Silver Jubilee event on 7 October at Doncaster Racecourse. Fisher Scientific, part of Thermo Fisher Scientific Inc., the world leader in serving science, recently announced the winners of the Supplier Awards during its fourth European Sales Conference, held in Malta. Fisher Scientific - part of Thermo Fisher Scientific - saw its biggest audience to date at this year’s Activate Science European road-show. Science World - the Fisher Scientific Laboratory Experience, was held on the on 2nd September 2014 at the bcc Berlin Congress Centre GmbH. Fisher Scientific, part of Thermo Fisher Scientific Inc., the world leader in serving science, today announced the full programme of events for their annual customer show Science World. The event takes place on October 10th at ‘The Point’, Old Trafford and is free to attend. Fisher Scientific, part of Thermo Fisher Scientific Inc., today confirmed the dates for their ‘Activate Science’ events planned across the UK and Ireland during September through to November 2011. Fisher Scientific, part of Thermo Fisher Scientific, today announced savings of up to 40 percent on GE Life Sciences illustra™ Ready-To-Go PCR beads and PCR purification kits. The offer ends 31 July 2011. Fisher Scientific Holds Joint Sales Training Event Feb 22, 2011 Fisher Scientific, part of Thermo Fisher Scientific Inc., today announced the success of their RESULTS training event that took place over three days, starting on 11 January, at the Barceló Hotel at Hinckley in Leicestershire. Fisher Scientific Receives Sponsor Status from BioCity Nov 8, 2010 SUketu Shah, Laboratory Manager at BioCity in Nottingham explains why he is happy working with Fisher Scientific, a preferred supplier to Biocity. Science World 2011, the Fisher Scientific Laboratory Experience, is Back! Nov 8, 2010 Fisher Scientific, part of Thermo Fisher Scientific Inc., today announced the date and location for Science World 2011, the Fisher Scientific Laboratory Experience. The event takes place on Thursday, April 28 at Magna Science Park. The Fisher Scientific Lab Start Up Program - Ten Years on and still Going Strong! Nov 8, 2010 If you are a new grant holder, moving to a new lab or involved in setting up a new lab, then the Fisher Scientific Lab Start Up Program could save you thousands of pounds! Dr Sue Shackleton, Leicester University, speaks of her experience when she used the program to set-up a new laboratory. Fisher Scientific Offers Special Prices and Free Commissioning on Biological Safety Cabinets Aug 16, 2010 Fisher Scientific, part of Thermo Fisher Scientific Inc., today announced the availability of two competitively priced Biological Safety cabinet packages. New Fisherbrand Homogeniser Packages from Fisher Scientific Aug 3, 2010 New Fisherbrand homogeniser packages now available from Fisher scientific. Fisher Scientific Announces Special Offers to Benefit New Life Science Laboratories Jul 21, 2010 Fisher Scientific, part of Thermo Fisher Scientific Inc., today announced the launch of a dedicated life sciences supplement to complement its existing 2010 new Lab Start-Up (LSU) programme, enabling scientists to save money with reduced prices, free accessories and special offers. Fisher Scientific Launches New range of Fisherbrand Electrophoresis Systems Jul 20, 2010 Fisher Scientific, part of Thermo Fisher Scientific Inc., today announced the launch of an exciting new range of Fisherbrand electrophoresis systems. The range encompasses SUB-GEL horizontal and Verti-Gel vertical gel electrophoresis systems, which are unsurpassed in their quality, flexibility and ease of use. New Range of Anatomical Pathology Products now available from Fisher Scientific Jul 20, 2010 Fisher Scientific, part of Thermo Fisher Scientific Inc., today announced the addition of the Thermo Scientific range of Anatomical Pathology products to its portfolio. Fisher Scientific and Thermo Scientific Donate Spectrophotometer to Cancer Research UK Jul 20, 2010 Fisher Scientific and Thermo Scientific, part of Thermo Fisher Scientific Inc., today announced that they had jointly donated a new spectrophotometer to Cancer Research UK (CRUK).